What is your WHY? Will you live for your REASON or let it be your excuse? I know that I have told everyone this before but my children and my family are the reason that I work as hard as I do. They are my WHY. I love them more than life itself. When I began this journey as a coach I was in a place that was not fun. Our home had just caught fire and we had no insurance and both of us were without a real stable income. 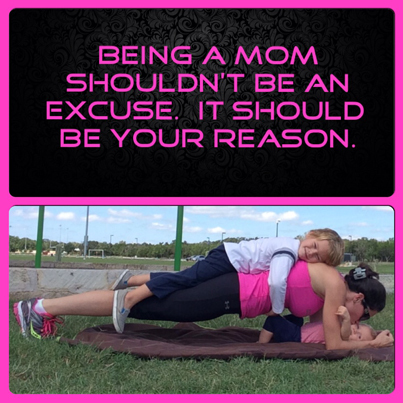 I was trying to start back into a fitness routine after having been restricted for 5 months in fear of preterm labor. Our entire family was living on peoples couches and accepting help from family and friends. With a 4 yr old and a 2 month old this was just not okay with me and I decided then and there that something had to give. I asked for a sign and I heard it loud and clear. I want my children to grow up in a healthy active family with parents who support each other and in an environment that makes exercise and healthy nutrition a priority. I want them to understand the value of a dollar and hard work/dedication and passion for what you decide to do in life. They are my REASON for Making the time for myself, not to sit on the couch but to take care of my body, INVESTING in good quality food and our health. Is it hard…YES. Is it an EXCUSE? NO! Everyone can find the time and make it work if you want it to and if it is important to you. Just Do it. The rest will work itself out. What are you doing to take care of your family and their future? Their Health? Not sure where to start? I can help. I want to get to know you and your why. Get involved in a group that will help you and support you through to your goals and then onward when you achieve them and create new ones. Ask me HOW? Apply for a challenge group. I am here to help you. I am still working on my goals and will always be growing and dreaming bigger as long as I am living. Share this if you know someone else who may want help or support in achieving their goals. After hearing other amazing stories today this is just something that was on my heart and I wanted to share. I wish everyone would be able to set the excuses aside and focus on the real reasons why they need to make a change in their lives. Sometimes it just takes listening to someone else and their story to help guide you through to the realization of your own why and helping you to find your motivation and inspiration.